Nicknamed Black Caesar, Matthews has never been seen again in what has become one of organized crimes most intriguing mysteries. Crazy Charlie, Carlo Lehder rose from a struggling, small time pot dealer to become a major godfather in the Medellin cartel, the crime syndicate largely responsible for initiating the cocaine epidemic plaguing American society since the late 1970s. Diary of a Motor City Hitman is about Detroit’s most feared enforcer from the 1970s, Chester Wheeler Campbell. Pablo Escobar vs Cali Cartel covers the epic death struggle pitted Pablo Escobar, the so called world’s greatest outlaw, against the powerful Cali Cartel, led by the brothers Gilberto and Miguel Rodriguez Orejuela. The Gangsters of Boston is the first comprehensive account of three centuries of thug life in the city where America began. In chilling new detail, veteran Boston journalist George Hassett reveals the legendary crime stories of Boston. 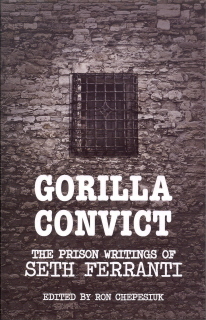 Gorilla Convict: The Prison Writings of Seth Ferranti is a selected compilation of Seth’s work giving the scoop on street legends, the mafia, prison gangs, hip-hop and hustling and life in the belly of the beast.